Selling your home can be a tedious process, and you want to make sure your property appeals to the general masses before listing it on the market. From basic upgrades to meticulous landscaping projects, there are dozens of ways to enhance your home’s exterior appearance to potential homebuyers. 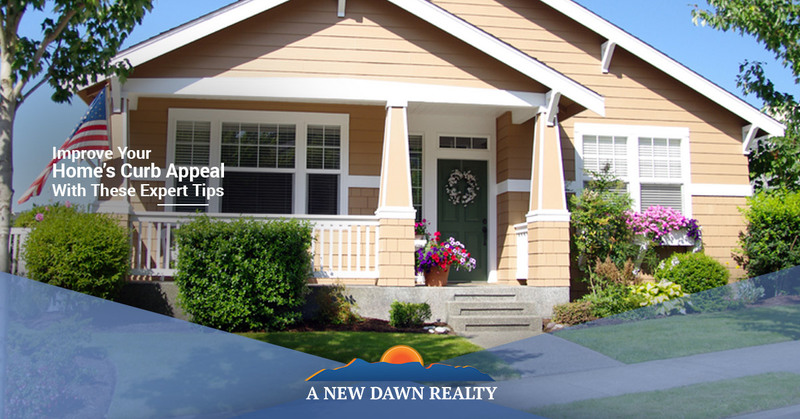 In this blog, we’ll take a look at a few pro tips to improve your home’s curb appeal. At A New Dawn Realty in Stokesdale, we’ve helped hundreds of North Carolina residents sell their homes quickly and efficiently. If you need assistance preparing your home to sell or you have any questions about the current real estate market, contact our realtors today! If the exterior of your home is dull or leaves much to the imagination, consider installing outdoor lights along your entryway or walkway. Not only are walkway lights a great way to welcome guests and visitors to your home, they also provide an added layer of safety. Solar lights are an excellent option for sidewalks and paths since they don’t require running an electrical cable or the use of extension cords. Even if you weren’t born with a green thumb, planting flowers can add tremendous decoration to the exterior of your home. Whether you plant lilies along the sidewalk to your house or roses inside flower boxes, adding more flowers to your landscape will make it appear more inviting. It’s also one of the most cost-effective ways to make a big impact on potential buyers. Adding a new coat of paint to your front door can transform your home’s exterior. There are a variety of door colors, styles and options to choose from, so you’re sure to find one that meets your needs. If you need help buying or selling a home in North Carolina, contact the realtors at A New Dawn Realty today!